I met Linda Pelkey early Sunday morning so we could leave her car at the takeout at Beitner. We did a quick transfer of her boat and gear to my car, and then drove to Brown Bridge Landing, where we met Kathy Kuper and Dorelle Ackermann. 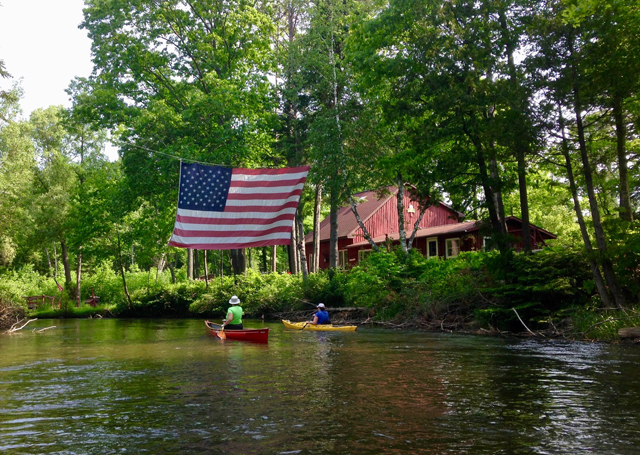 They are members of the TAPC, but live in Illinois, so when I found out that they were heading up north, I scheduled this trip just so they could paddle on our home town river. They were not disappointed; it was a gorgeous day to be on the river, and to have time to chat as we headed downstream. 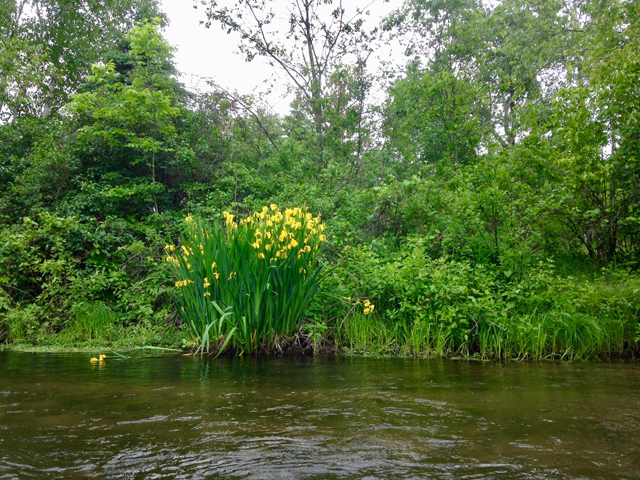 There were no other people around until we hit Shumsky, but there was a plethora of both yellow and purple wild irises. The real highlight was coming almost face to face with a very large buck, who was standing in the river getting a drink. We were quiet enough so that he just looked up and stared at us before heading onto shore and back onto the brush. We also noticed a robin taking a bath! We took a short break at Shumsky where one other group was launching, and then continued on to the takeout, where Linda took our drivers back to retrieve our cars. Kathy had never been on the Boardman before and was amazed by how pristine it is. Anyone who is reading this probably knows about the Boardman River Clean Sweep, which had taken place two weeks earlier. So it was wonderful to see the river basically spotless, although I did pick up a large hunk of styrofoam, and Dorelle snagged a couple of beverage containers that were floating in plain sight.